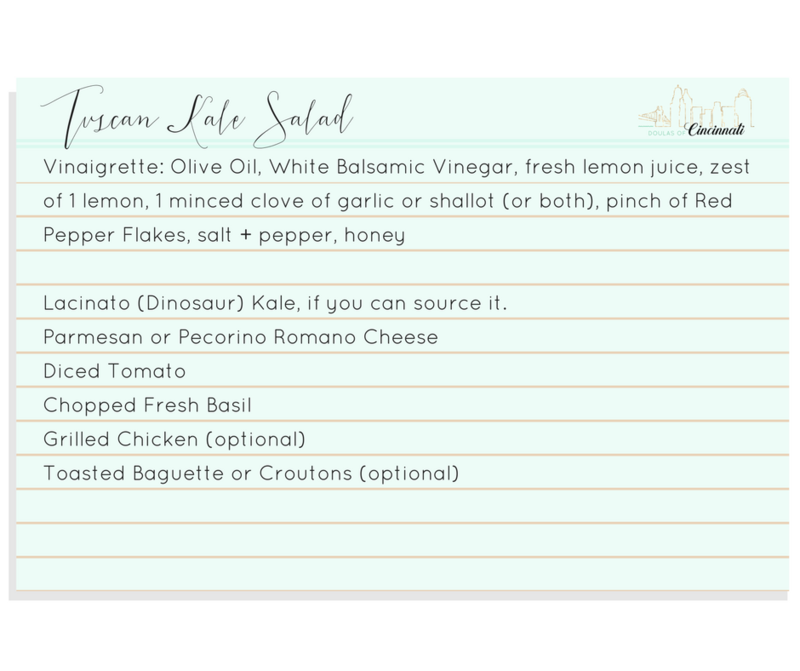 It’s no secret that I love Kale Salad. 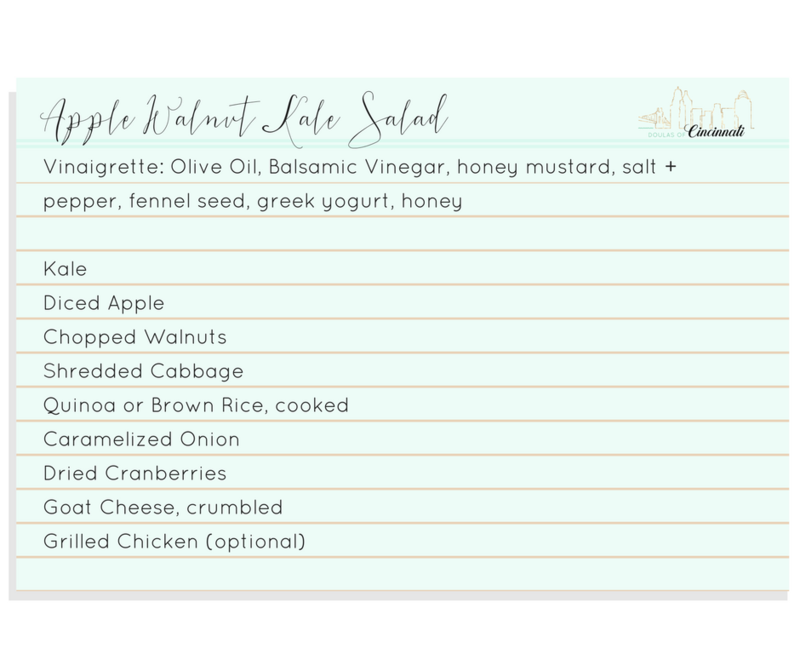 If you’re a DOC client, and I’ve been your doula - especially for Postpartum & Infant Care - then you’ve probably seen me throw down a medium sized mixing bowl of this yummy goodness at lunch. It’s a favorite when I meal prep for clients and at DOC team building meetings. 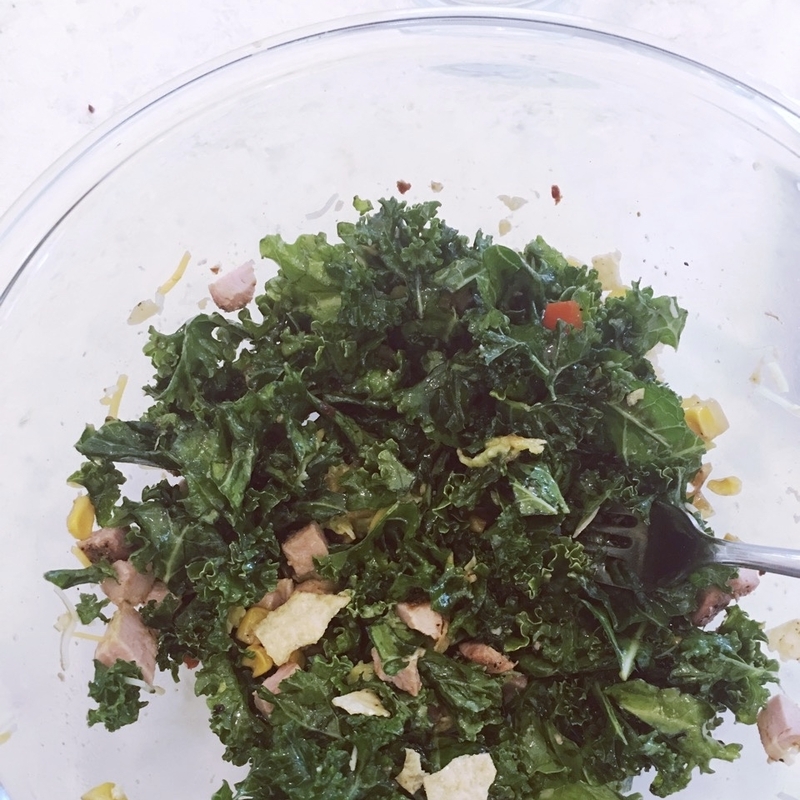 The possibilities for Kale Salad are endless. 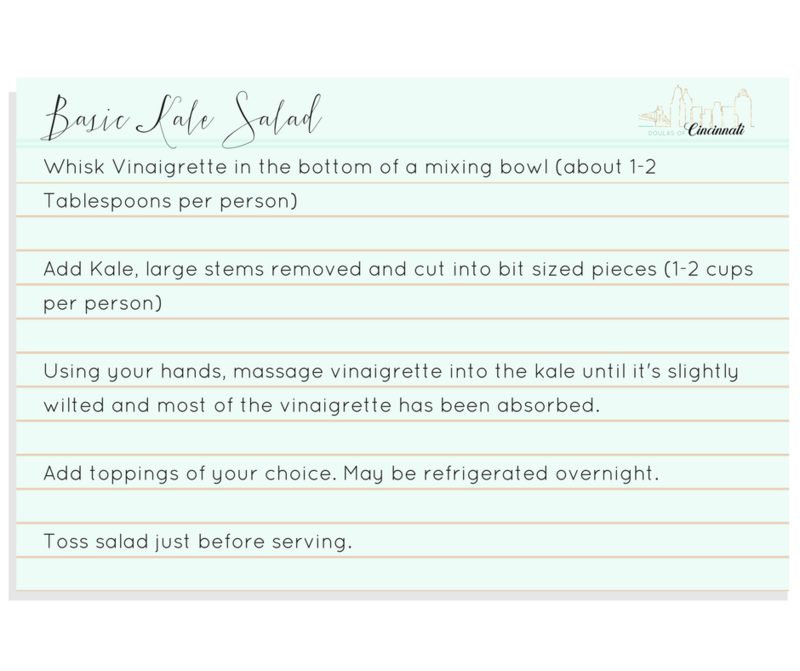 Start with a vinaigrette base. Add some chopped Kale. Add some more veg, protein of choice, a healthy fat like cheese or avocado, maybe some nuts or seeds and you have a really quick and nutritious meal on your hands. And we all know that those leafy greens are good for you. I often get asked what kind of vinaigrette I buy. It takes me more time to run to the store and walk the aisles than it does to whip up the dressing in the bowl while I make the salad. A modestly stocked pantry can yield wonderful results. If you want to make a larger batch you can use a blender and refrigerate covered for 2-4 days. 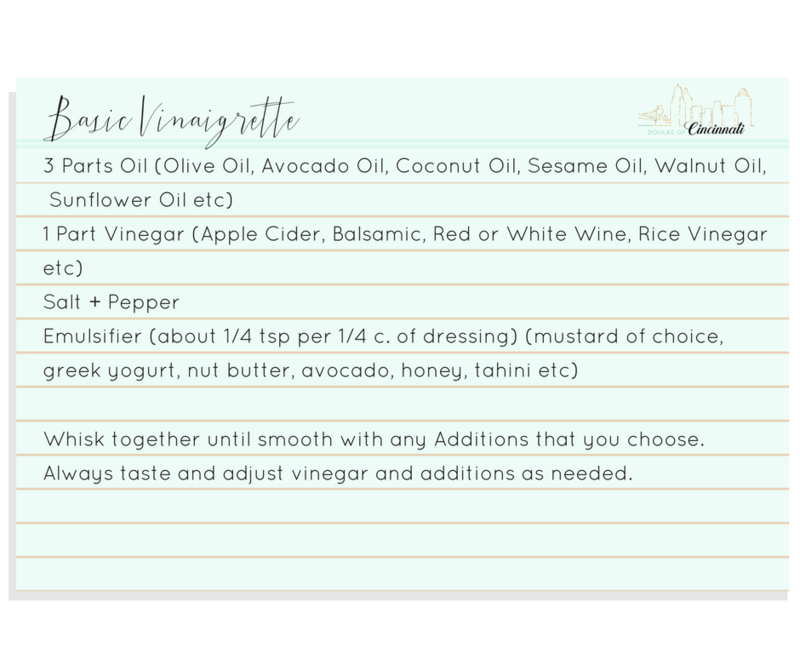 And if you really don't have the time to whip up your own (working mom here, I get it), any basic vinaigrette dressing from the store will do. You'll need about 1-2 tablespoons per person. At the grocery I look for seasonal vegetables and cheeses that would make a nice addition to proteins and grains that I’m already cooking for the week. If I don't have a particular recipe in mind I just make it up as I go. You can easily adapt the salad to be served as a main course, a side, gluten free, vegetarian and and vegan. Speaking of vegan...did you know that Emily was vegan? Me?...Never in my cards...I love bacon too much. Prepping meals before or after baby arrives? Let the DOC team help you create, customize and prepare a Meal Plan that's perfect for your growing family, lifestyle and your schedule. Contact Us Today.